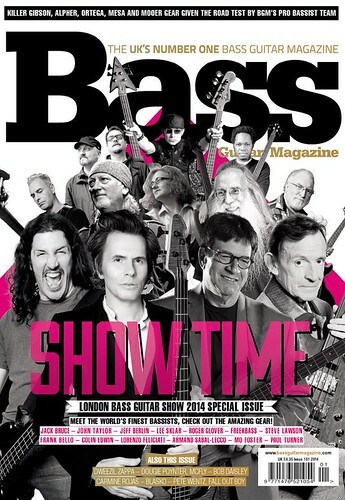 Gig at The London Bass Guitar Show, On The Cover Of Bass Guitar Magazine! Exciting News! I’m playing at the London Bass Guitar Show on March 2nd. Want proof? OK, all the mainstage artists are pictured on the cover of this month’s Bass Guitar Magazine, with me right in the middle. Oh yes. Good times, eh? I’ll be on at 11:15am on Sunday 2nd March, though I may actually be on a little earlier than that in the masterclass room, talking to one of my heroes and friends, Leland Sklar… the two sessions overlap, so we’ll have to see how the planning works out! SO looking forward to this – a solo set on the mainstage at London Bass Guitar Show – one of the finest bass events in the world. the line-up all weekend is brilliant – Lee Sklar, John Taylor, Mo Foster, Lorenzo Feliciati, Paul Turner, Freekbass – good people! I’ll be there both days, around the Markbass booth too, so please come and say hi! I will be there and look forward to seeing you!